This case study of the Peruvian altiplano, the vast high-altitude plains surrounding Lake Titicaca, combines economic and social analysis with cultural and institutional history. 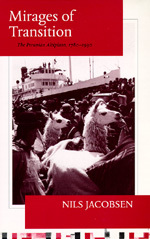 Nils Jacobsen challenges the prevailing view that the rural Andes underwent a successful transition to capitalism between the mid-nineteenth and early twentieth centuries. He argues that although the political, economic, and administrative structures of colonialism were gradually dismantled by the region's advancing market economy, colonial modes of constructing power and social identity have lingered on even to this day. The result of painstaking research in remote rural archives, some of them now made inaccessible by the Shining Path, Mirages of Transition will become the definitive work on the Peruvian highlands. Nils Jacobsen is Associate Professor of History at the University of Illinois, Urbana-Champaign.